CALIFORNIA -- The fate of 174 Chihuahuas housed at a shelter after being seized from an Acton breeder's home remained unresolved Thursday after an agreement on what to do with the dogs fell through. Breeder Emma Harter did not want to sign on to the agreement, indicating that she wanted to talk to her husband first and also to Los Angeles County officials about the $500,000 in impound fees that she might be liable for, prosecutors said. "She wanted to speak to her husband and was concerned about the impound fees," Deputy District Attorney Steven Heller said after a court hearing. The dogs have been housed at a shelter in Baldwin Park since being taken by authorities from Harter's residence in November. It has cost the county about $500,000 so far to keep the dogs, a cost of about $2,000 a day, Heller said. Lancaster Superior Court Judge Richard Spann put off making a decision about what to do with the dogs until a hearing next month. At Harter's home, the animals were living in such tight quarters that the Chihuahuas had formed feral packs that preyed on weaker dogs, Los Angeles County animal control officials have said. Inbreeding also had affected their behavior, officials said. Officials at the shelter said just 36 of the dogs are adoptable, but officials with a Burbank-based Chihuahua rescue group that has been leading the effort to save the dogs from being destroyed have said the dogs can be rehabilitated and saved. The proposed agreement called for the dogs to be handed over to Chihuahua Rescue to be adopted, rehabilitated for adoption or housed in humane conditions for the remainder of their lives, Heller said. The attorney for Chihuahua Rescue said in court that the organization had worked with Harter to come to an agreement. "We have been working with Miss Harter to try to facilitate this. We are just as surprised as anyone that this has occurred today," attorney Shannon Keith said in court. "We have folders of rescue organizations ready to take the dogs." After the hearing, Kimi Peck, founder of Chihuahua Rescue, said she was devastated and declined to comment further. Harter's attorney said in court that Harter was unable to reach her husband by cell phone. Harter, 72, whose 1995 conviction for operating an illegal kennel was overturned, is facing felony animal-cruelty charges in the case. She has not been arraigned, pending a decision by the judge about what to do with the dogs. 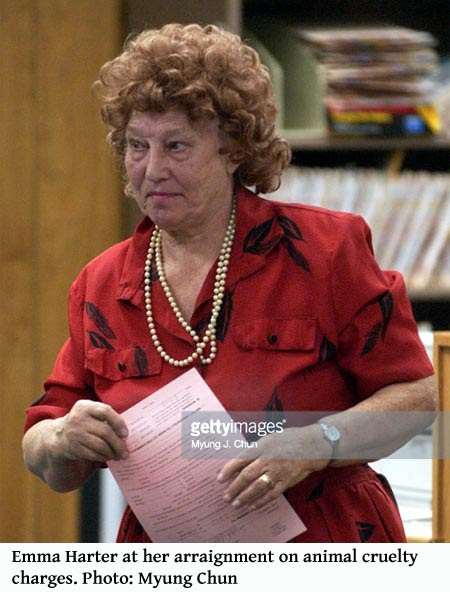 Harter, a retired school cafeteria manager, remains free on her own recognizance. Harter was convicted in 1995 of operating an illegal kennel for about 40 Chihuahuas that shared her home but acquitted of charges of creating excessive noise and a public nuisance when her dogs barked. She received a suspended sentence of up to 180 days in jail and was ordered to erect a building to house the tiny canines on her three-acre spread rather than keep the animals in her house. An appellate panel of three judges reversed Harter's conviction in 1997, citing a trial court error in instructing the jury. Prosecutors at the time decided not to retry the case because it appeared Harter had corrected the problems, officials said. -- and because twenty years ago they didn't know how to prosecute criminal cases involving cruel confinement/hoarding. CALIFORNIA -- It's a story of what happens when Chihuahuas go bad. Granted, some people could argue that Chihuahuas always go bad, but perhaps sympathy is in order because 174 little lives hang in the balance. The saga involves a breeder who let things get out of control, two competing Chihuahua rescue groups, a judge who must determine the dogs' fates and, of course, all those Chihuahuas. Indeed, some of these vicious little dogs have been attacking -- and killing -- each other during their eight-month captivity at a Baldwin Park animal shelter. But another Chihuahua rescue group, which plans to hold a candlelight vigil today, is lobbying hard to win freedom for the dogs it calls "angels on death row." "Chihuahua Rescue just believes that every dog has the right to live, whether they have behavior problems or not," said Devon Miller, the Burbank-based group's rescue coordinator. "They might not be great with humans, that doesn't mean they cannot have a wonderful life in their own environment." At that time, neighbors of Emma Harter complained that the animal breeder was housing the dogs in unsanitary conditions. County animal officials raided her property in Acton, an unincorporated rural community in the hills between Santa Clarita and Palmdale, and found scores of the tiny dogs living in close quarters. Too close, as it turned out. 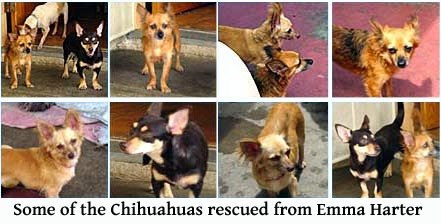 The dogs were not neutered or spayed and more Chihuahuas were later born at the shelter in Baldwin Park. The district attorney's office has filed two felony and four misdemeanor animal cruelty charges against Harter, who is awaiting arraignment. Harter could not be reached for comment. 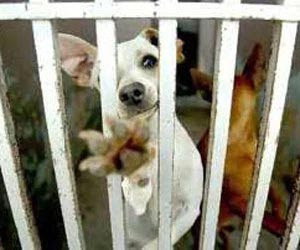 The dogs now occupy one of the Baldwin Park facility's three kennel buildings, five or six dogs per cage. The sheer repetition of Chihuahua after Chihuahua takes some getting used to. There are roly-poly ones and skinny ones. There are long-hairs and the lean "Yo quiero Taco Bell" variety. The dogs are tan and black and white and mottled. 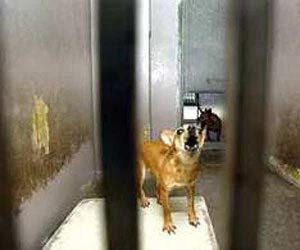 When a human enters the kennel building, some dogs growl, others cower. None appears friendly. They bare their teeth and visitors wouldn't dare pet one. A couple who learned of the Chihuahuas' plight visited the shelter Tuesday, not realizing the dogs were not available for adoption. The couple walked into the kennel, setting off a fresh round of barking, yapping and growling. They quickly retreated and went to look at cats. "We don't want to put any animal to sleep that doesn't need to be put to sleep," said Kaye Michelson, a spokeswoman for the Los Angeles Animal Care and Control Department. "But we need people to realize what they are getting into with these dogs. They are pretty unsocialized and have some behavior issues." She added: "We are working with the rescue group and we will go with the judge's decision." Richard Spann, a retired Superior Court judge brought in to hear the case, on Thursday is scheduled to hear from a team of animal behaviorists -- including nationally known pet expert Warren Eckstein -- who have been evaluating the Chihuahuas for several days. At issue now are 174 dogs. Some of the original 236 died or were so sick that they had to be destroyed. Some of the puppies born at the shelter were put in foster care before they could learn their parents' wild ways. "The bottom line is there's not a dog in there who can't live with somebody," Eckstein said. Peck said her group would hold its vigil at a kennel she runs in Burbank tonight to call for the dogs' rescue. She said she has also chartered buses to transport supporters to the courthouse in Lancaster for the hearing before Spann. Hoping the judge would find in the group's favor, Peck said she was prepared to house some of the dogs at her kennel. She said animal rescue groups around the country have also volunteered to take in the dogs. Alaska Airlines has agreed to transport the dogs to cities where rescuers were standing by. "We're ready to go," said Peck, the former daughter-in-law of the late Gregory Peck. But not everyone agrees that these dogs' barks are worse than their bites. "We have received information that the majority of the dogs are not adoptable because of serious genetic/health and behavioral problems due to inbreeding and lack of socialization," according to the Web site, www.chihuahua-rescue.com. "Therefore, we cannot support these dogs being placed in any homes." In a follow-up e-mail, group official Lynnie Bunten said: "Lots of well-meaning folks are scurrying around on the Internet in a frenzy to try to save them all. Most are not going to be saved because they are so aggressive." "I have been rehabilitating dogs like this for the past 10 years," she said. "I know it can be done."